What is the percentage of students in Houston that fail to graduate? Did you know that 47% of students in the greater Houston area fail to graduate? 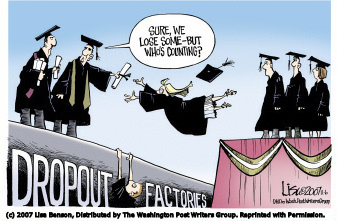 This dropout rate is the fourth worst in America. Even if the rate was just 20%, the future does not look bright for Houston. What can we do to help motivate students to stay in school? Volunteer at Communities In Schools (CIS)! Their mission is to surround students with a community of support, empowering them to stay in school and to achieve in life. Yes! 99% of high school CIS students stay in school. CIS in Houston has a 30 year history of success. In fact, the ICF verified that CIS is the only program to make a meaningful impact on both increasing graduation rates and decreasing the dropout rate. When these at-risk children know that someone cares and is there to inspire them when the come across whatever challenges they may face, it builds hope for them, it makes them stronger, helps them to persevere. When there is support, there is a desire to go on to achieve the success they might never have thought possible. Dropout prevention programs put money back into the state treasury through increased tax revenues from graduates and also decrease the future amount the state would more likely have to spend on welfare, medical costs and prison time for children who have dropped out of school. Lets help these at-risk students become productive members of our city and write to our state officials expressing our support for Communities In Schools. If you are in the business community, support the best economic stimulus program around: an educated workforce in Houston. Original article written by Linda Gale White, “Education aid program saves money for Texas”, Houston Chronicle, May 15, 2011.